On the Potomac Palisades in North Arlington, Potomac Overlook offers 67 acres of peaceful woodland, trails, educational gardens, a small picnic area and a Nature Center. The Nature Center features exhibits called the "Energerium," offering visitors a fun and accessible way to learn energy basics and ways they can help create sustainable energy solutions. The Nature Center also houses live animals and natural history exhibits and is the office for NOVA Parks naturalist staff. The Nature Center houses the Energerium, a suite of interactive exhibits that highlight the connection energy forges between the human and the natural world. The displays blend lessons from ecology, earth science, physics, and other topics in understandable ways. The Energerium and Nature Center include live animal exhibits, a library, an interactive MiScope, and displays that highlight the role energy has played throughout human history. Outdoor energy exhibits include a 1KW solar array on our stage. Park staff also present programs featuring the interactive "Energy Cycle." For more information download our Energerium Fact Sheet. To schedule an energy program call or email us at 703-528-5406 orPotomac@nvrpa.org. Check out our Facebook page for updated park news, program listings, trivia, and other fun posts! Temple Hall Farm Corn Maize and Fall Festival! Mark your calendars as it’s almost time once again for the BEST Fall Festival in Northern Virginia – Temple Hall Farm Corn Maize and Fall Festival! Open Fridays, Saturdays and Sundays from September 26 to November 4. Buy your tickets online today and SAVEhttp://nvrpa.ticketfly.com/ . For more information, visitwww.templehallfallfest.com. Join us at the park for a grand Halloween party, including live music, food, games, arts and crafts, storytelling, and guided hikes through the woods. People of all ages are welcome! Cost is $10 per participant over the age of 4. Advanced reservations and payment required. Reservations will start at the nature center at 10AM on Saturday, October 4. Our well known Holiday Crafts workshop is coming up on Sunday December 7th at 1PM. A perennial favorite, this program allows participants to come make their own wreath or centerpiece using local greens, pine cones, and many other natural materials. With guidance from our staff, you will have a beautiful wreath to take home for the holiday season! Cost is $20 per particpant. Spots fill fast! Call 703-528-5406 to make a reservaiton. Our naturalist staff is eager to work with teachers to plan and tailor programs to individual needs, interests, and age groups. Teachers and other groups can call anytime to reserve programs, however, 1-2 months advance notice is recommended. All programs meet various Standards of Learning requirements. Where specifically keyed to programs, SOLs are shown in bold face. Contact School Program Coordinator Casey Pittrizzi for reservations atcpittrizzi@nvrpa.org or 703-528-5406. If you don’t see a program or topic you are looking for, give us a call. We have done many programs about various topics including decomposers, web of life, ecosystems, animal classification, and many more! Our staff is happy to work with you to create the best possible learning experience for your class. Fees: Field trips to the park are free for schools in the NVRPA jurisdictions (Arlington, Fairfax, Loudon Counties and Cities of Falls Church, Fairfax, and Alexandria). 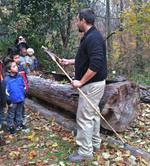 Field trips for schools outside the NVRPA jurisdictions are $55 per program. Outreach programs are $55 per program. Click here for the school programs listing. Are you ready for the birthday party of a lifetime? Reserve your Nature Center Birthday Party today! Call us at 703-528-5406 to schedule your date. Reserve your party at least three weeks in advance. Reservations are held for one week and are confirmed when payment is received. Birthday party program fee is $175. See Birthday Party Reservation Form below. Plan your next outdoor event at Potomac Overlook! The shelter is available for rent in 4-hour time blocks Tuesday-Sunday. The rental includes the 4 picnic tables, bench circle, power outlets, bathrooms (these are also available to the public), and a near by playground. The cost is $60 for residents of any of NVRPA's participating jurisdictions and $80 for residents outside of NVRPA's participating jurisdictions. See the Shelter Rental Form below. The Grapevine is the official newsletter of Potomac Overlook Regional Park. The Nature Center at Potomac Overlook is well known for its collection of live reptiles, amphibians, fish, and birds of prey. These animals are kept in exhibits that are open to the public to view during our normal hours. Our staff and volunteers also use many of these animals for interpretive programs for the public, schools, summer camps, and many other groups. Many of our exhibit animals have been here for over 10 years! In fact, did you know Potomac Overlook had a Canebrake Rattlesnake that was collected in southern Virginia in 1978 and lived here until the winter of 2011? Our rattlesnake helped educate the public about venomous snakes for 33 years! Additionally, the Red-tailed Hawk in our bird of prey house has been here since 1983! She is at least 33 years old! She could be even older! Our Mole Kingsnake is another exhibit animal that is over 20 years old. We are very lucky to have a diverse array of healthy and long-lived animal ambassadors that help interpret the natural world to the public. Through our strong partnership with the Raptor Conservancy of Virginia, we are able to provide a home to raptors that are permanently injured and would not be able to survive in the wild on their own. 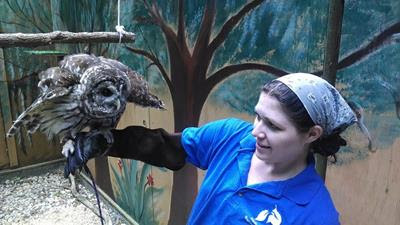 The picture above shows Naturalist Rea Manderino handling our newest addition, a Barred Owl. This Barred Owl was transferred to our facility after being with the RCV for about three years. The bird was hit by a car and suffered several broken bones in the left wing. Due to the damage, the bird is no longer able to fly well and would definitely not last long in the wild. Along with our Red-tailed Hawk, this Barred Owl is one of our education birds that we will take to schools, and bring out for special programs and field trips. The owl has already helped educate hundreds of children and adults about raptors. We hope the new owl is with us for many more years as one of our many great animal ambassadors. The Potomac Overlook management staff would like to send out a special thank you to the Raptor Conservancy of Virginia for all of their hard work in rehabilitation and education. For more information about the RCV, visit their website atwww.raptorsva.org. This year we've had an amazing team of interns and volunteers helping out at the park and with our summer camp program. We want to acknowledge and thank everyone who devoted time to the park throughout our very busy summer season. We could not have such fabulous camps and programs without you! Coline Macorol, Kyle Carver, Peter Jensen, Marie Serfis, Matt Miro, Fiona Harris, Emily Rarity, Jason Sprouls, Ian Susens, Scott Kilmer, RJ Firestone, Tony Cuellar, Hannah Soler, Jessie Oblon, Jack Lacey, Sam Varrieur, Rupert Schwartz, Max Undeland, Olivia Simek, Madison Gallant, Elizabeth Woolford, Lucille Sherlock, Lydia Matthews, Katie Hoskins, Georgie Greenhaus, Kate Meredith, Will Hubbert, and Charlotte Smith. I hope you had a great summer! Ours here at Potomac Overlook was incredibly busy with lots of campers attending our summer camps. Wonderfully led by our Naturalist and “Camp Director” Casey Pittrizzi, our camp staff and volunteer “Leaders in Training (LITs)" conducted nine camps with a total of 162 campers participating. Our campers ranged in age from rising Kindergarteners (our “Puddle Jumpers”) to our rising high school juniors (our “Rangers”). They were mostly here at Potomac Overlook – but many also visited many of our other NOVA Parks parks. We plan to do it all again next summer. Stay tuned for new information! Happy Almost Autumn!! Are you ready for cooler temperatures? Autumn leaf color? Critters getting ready for winter? We have lots of great programs planned for the upcoming months focused on many aspects of nature and history here at the park. These programs are listed elsewhere in this newsletter. I hope you will come join us for these programs – and help us at our Volunteer Work Parties – often! Finally, we’ve begun a new focus on customer service here at Potomac Overlook called “Props for PORP!” Our goal is to help you however we can to have a great experience here at Potomac Overlook. And we need your help! Tell us how we’re doing. Tell us what you liked about your experience and/or how we can make your next experience even better. Thanks!! Have a great late summer and autumn everyone!! I hope to see you often here at Potomac Overlook! One of our area’s most frequently seen snake residents, the Eastern Rat Snake or Black Rat Snake is a totally harmless local critter. Not only is it harmless, it is probably the best neighbor a person could hope to have. As the name implies, this large black snake eats animals like mice, rats, and chipmunks – none of which one wants moving into their kitchen. Rat snakes are also excellent climbers, and will eat birds and bird eggs. This Virginia native species is the largest snake found in the state, and can top out at over 6 feet long. As adults they have an almost solid black body and white to yellowish chin. This appearance is very different from their juvenile pattern. Hatchlings and young snakes have a pattern of dark gray to black blotches on a light gray background. The belly has a somewhat checkerboard –like effect, and is black and white. As the snakes mature, the pattern fades and they become solid black, with remnants of the pattern showing when the skin is stretched (as after a meal). The other similar looking snake is the Black Racer. Black Racers have smooth scales and white only on their chins. The Rat Snake has weakly keeled scales (there is a slight ridge running down each scale) and white on its belly. Eastern Rat Snakes are an egg laying species. They usually mate in May or June and lay their eggs in late June to early July. Eggs are typically laid in hollow trees, logs, and mulch heaps, and hatch by the end of September. The pattern shown by juveniles allows for better camouflage, as smaller animals are more vulnerable to predators than adults. Known predators include hawks, large owls, and domestic cats. April is when they emerge from hibernation and become active, using their territories and cover areas. They will be active during the day until early summer, when the extreme heat can be prohibitive. In winter, these snakes will seek shelter in tree stumps or hollow logs. Occasionally they will share their sites with other snakes, including copperheads. Eastern Rat Snakes will use the same locations for years. These good neighbor snakes are quiet, easy going, and eat all the animals you don’t want in your house. Count yourself lucky if you see them hanging out in the yard – they’re only around if there’s food (like mice!). Don’t forget to come visit Potomac Overlook’s two ambassador Eastern Rat Snakes on our lower level! MIGRATION MADNESS: WHY DO ANIMALS MIGRATE? Join us to learn about how a variety of animals prepare for winter – especially those that migrate south. We’ll discuss why animals migrate -- and when and where to observe these migrations. We’ll also visit our permanently-injured birds of prey. There is no cost for this program but a reservation is requested. As part of our weekly “Meet Me on a Sunday” event, join our Master Gardener volunteers for an enjoyable – and TASTY – late summer tour of our Demonstration Organic Garden. No reservations required. Get up and out early as we explore the park and see what bird species are arriving and leaving during the migration season. Our naturalist will demonstrate basic bird identification techniques by using songs, call notes, and behavior. Call 703-528-5406 to make a reservation. Meet at the Nature Center. “Energerium”?? What’s that? Join us for a guided tour of the “Energerium” exhibit aspect of our Nature Center. Learn the story of energy and its impact on everything on Earth. Discover ways to be more energy efficient at home, work and school. Reservations requested -- please call 703-528-5406. Spend a morning with park staff and volunteers helping with indoor and outdoor projects in your favorite park! Reservations NOT required — meet at the nature center at 10 AM. Snapping, box, and painted turtles! OH MY! Stop by the park to help our naturalist staff feed our resident hard tops. Reservations required. $5 per participant. Call 703-528-5406 to sign up! Ghosts at Potomac Overlook?? For real?? Join us as we tour the park to explore the history of the park and the people who lived here over the past centuries. Recommended for visitors 8 years old and older. Meet at the Nature Center. Dress for the weather and please wear sturdy walking shoes. Reservations required at 703-528-5406. Our snakes are hungry, why wait? Come learn about snake feeding and hunting habits, and see our program and exhibit snakes get fed. This program will feature a live mouse snake feeding. Reservations required at 703-528-5406. Cost is $5 per person. THERE’S A FIELD GUIDE APP FOR THAT? Join our naturalist staff for a new program all about field guide applications that are available on smartphones and tablets. This program will mostly focus on iPhones and iPads. Apps covering mammals, reptiles, birds, plants, and much more will be covered. Free. Call 703-528-5406 for reservations. Learn about the history of the Native Americans that lived here in Arlington centuries ago through a slide show, hands-on activities and a visit to our actual Native American encampment site. Adults and children age 8 and older are invited to attend. Please call 703-528-5406 to make a reservation. From the mysteries of the soil to the top of the forest canopy and everything in between, come and explore the amazing life, complexity and wonders that the woods can offer. We'll explore animals, insects, habitats and the magic of how the non-living "stuff" allows life to flourish in the woods. Water bottle suggested. Hiking shoes required. Call 703-528-5406 to make a reservation. Come and meet some of nature’s most interesting wild animals. Participants will learn how they grow, live and have adapted to take on their current form. The program will give participants exciting opportunities to learn how to safely handle and hold these local wild animals. Open to all ages. $5 suggested donation per person. Reservations required at 703-528-5406. SATURDAY, DECEMBER 6, 3PM: ANIMAL FEEDING 101– RAPTORS Venture into the Birds of Prey house and explore raptor feeding habits. This program will focus on how and what we feed our four permanently injured birds of prey. Meet at 3PM in the nature center. Reservations required at 703-528-5406. Cost is $5 per person. SUNDAY, DECEMBER 7, 1PM: HOLIDAY CRAFTS WORKSHOP A perennial favorite! Come make your own wreath or centerpiece from local greens, pinecones, and other natural materials. Cost is $20 per participant. Call 703-528-5406 for reservations. GETTING READY FOR WINTER Discover the sercrets of how many of our local critters prepare for and survive the winter. This program will explore birds, mammals, and many other critters native to the park. Call 703-528-5406 for reservations.